Process monitoring system with stainless steel surface and inputs for humidity, temperature or external pressure transmitters. 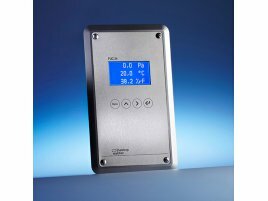 The PUC 24 process monitoring system is especially suitable for pressure monitoring applications in cleanrooms, laboratories, pharmaceutical plants and operating theatres. The system has two electrical inputs for humidity, temperature or external pressure transducers. The measurement values provided by these devices are displayed on the graphic LCD display. As well as recording differential pressure, it also measures positive and negative overpressure and is freely scalable within the measuring range. Two optional contact points allow the user to connect visual or audible alarms that are triggered any time values rise above or fall below specified limits. These threshold values can be set as parameters both for the internal differential pressure sensor and for the external humidity, temperature or pressure transducer. The transmitter can be configured easily via an RS 232 interface (optional) with software. This can also be performed using a keyboard and display. A selectable time constant allows the transmitter to be adjusted perfectly to the pressure conditions and thus ensures a stable output signal. The PUC 24 is suitable for wall mounting in cleanrooms due to its smooth, solvent-resistant stainless steel housing. The device is easily integrated into central building control systems via the optional PROFIBUS DP interface. In this case, the Profibus connection acts as a gateway for the analogue signals from the external transducers, which thus require no PROFIBUS DP interface of their own. The instrument is available with an ISO factory calibration or DAkkS calibration certificate (optional).